Several folks have contacted me, wondering why the pace of my blog posting has slowed a bit in April. Don’t worry - all is well on the farm and sanctuary, it’s just spring planting, maintenance, and trail building time. The snow has melted, the weather is mild and the plants/animals need more attention that ever. Here’s what we’ve been up to over the past two weeks. 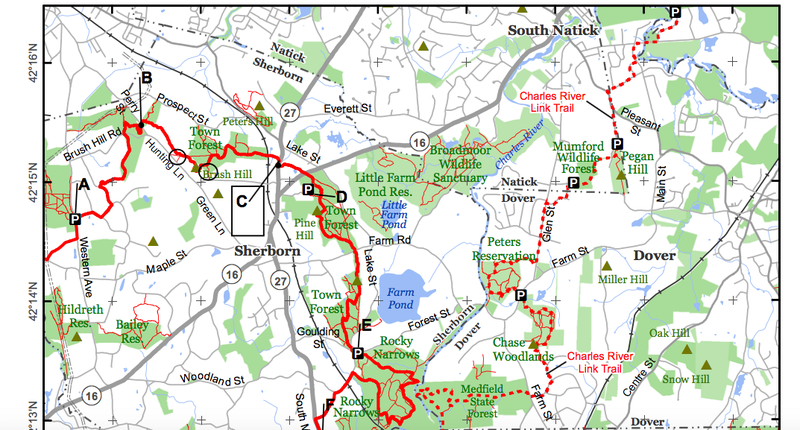 The adjacent landowner to Unity Farm and Sanctuary is the Sherborn Rural Land Foundation and they’ve asked for our help maintaining their protected land. 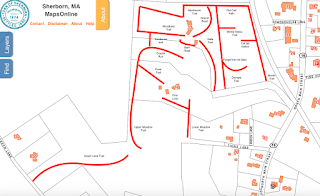 I’ve expanded our trail system to cover 60 acres with over 3 miles of paths as pictured below. We now have 18 trails and 8 bridges that traverse through ecosystems ranging from dry oak to wildflower meadow to fern grottos. Each bridge weighs about 500 pounds, so hauling all that lumber into the forest means that I walk about 15 miles per weekend day. 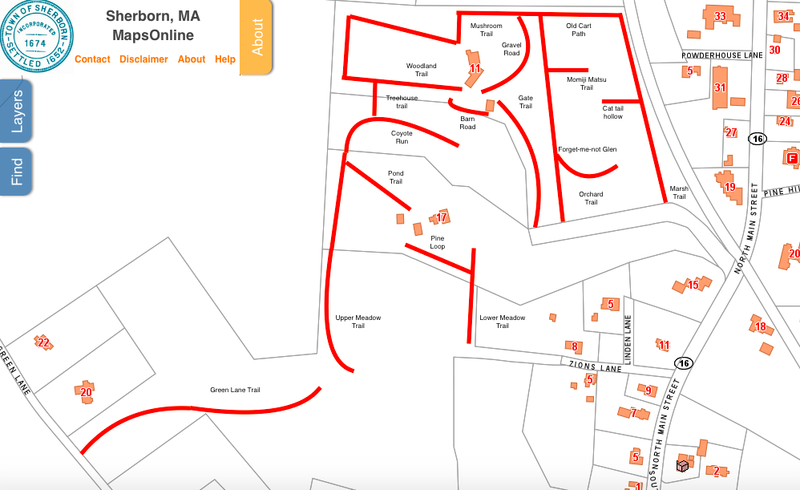 The new paths (in the black square box below)) enable us to connect to the Bay Circuit trail (in red below)- a 200 mile path from Newburyport, MA in the north to Duxbury, MA in the south. 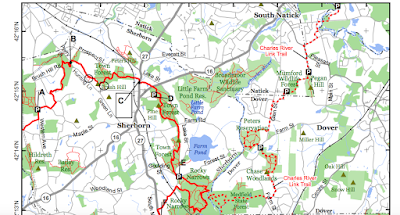 It’s fair to say that Unity Farm and Sanctuary paths enable 100 mile walks in each direction! Part of maintaining wild forests is removing a century of garbage that others have thoughtlessly dumped there. I removed over a ton of debris from the farm forests and a ton of debris from the sanctuary property. I removed a similar amount of old furniture, plastic and metal from the Rural Land Foundation property. I definitely got my exercise hauling everything from the forest to a golf cart parked on a nearby road. Part of the Rural Land Foundation property is a 5 acre meadow. We gently raked the land and spread native wildflower seeds over the area. We’ll have significant rain this week, so hopefully the new sprouts will get a healthy start. Kathy will likely add new bee hives to the meadow this Summer. All of the animals continue to thrive and they are enjoying the warmth of spring. The pigs want their daily massages and demand our attention. Here’s what rolling in the hay with pigs looks like. We’re continuing our work on paddocks, fences, and run ins. By Summer I’ll post pictures of the finished result - interconnected space for horses, donkeys, pigs, goats, cows, llama/alpacas, poultry and other animals that need sanctuary space. We’ve lived at the farm for 5 years as of today. Who would have guessed 5 years ago that we would have so many vibrant activities around us every week.